Guido Molinari was born in Montreal in 1933. Suffering from tuberculosis as a teenager, he spent his confinement studying great philosophers such as Friedrich Nietzsche, Jean-Paul Sartre and Albert Camus who would later influence not only his approaches to art, but also his own theoretical writing and teaching. 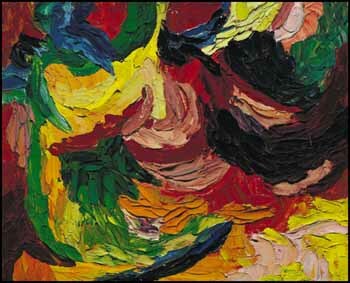 He attended the École des beaux-arts and the Montreal Museum of Fine Arts, where he was inspired by the Abstract Expressionists and Montreal’s Automatists to begin making his own automatic paintings. He quickly adopted a more regimented approach to their technique, and at the same time set out to destroy the necessary foreground and background of a composition. In M-3 we see this goal in progress; by using colours of similar vibrancy, Molinari examines form and shape and how they recede and advance through the composed space. In 1955 Molinari formed the Galerie l’Actuelle, which was the first gallery in Canada dedicated entirely to abstract art, and in 1956 he became a founding member of the Association des artists non-figuratifs de Montréal.